Going vegetarian may be the most effective way to stop climate change. "Raising crops so we can feed them to animals so that we can eat animals is vastly inefficient." Global warming is one of if not the most urgent problems threatening the planet and her inhabitants, including humans. Global temperatures are higher than they’ve been in over a thousand years. The increase in temperature is already leading to coastal flooding, increases in extreme weather, disease, and mass extinctions. Over 99% of scientists worldwide agree that global warming is caused by human activity, specifically greenhouse gas emissions. The most destructive of these is methane, and the number one producer of methane is livestock. 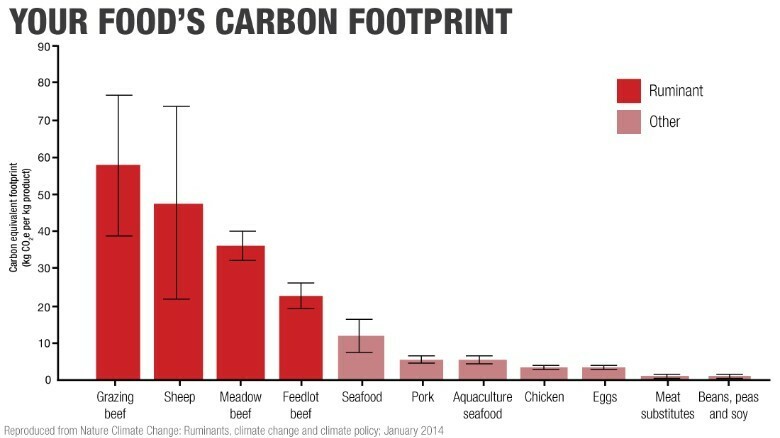 The livestock sector generates more greenhouse gas emissions (18%) as measured in CO2 equivalent than any other industry including the transportation sector. This is due to a combination of factors including the CO2 emitted in the transport of animals but even more significant is the methane emitted by livestock, which is 21 times more powerful a greenhouse gas than is CO2. For this reason, animal agriculture is now considered by the United Nations and many leading international non-governmental organizations (NGO’s) to be the leading contributor to global warming. In a study done at the University of Chicago, researchers concluded that animal agriculture contributes more greenhouse gas to the environment than the entire transportation sector does, and individuals could do more to help the environment by switching to a plant-based diet than almost any other individual act including switching from a gas guzzler to a hybrid. Animal agriculture is a major driver of deforestation as forests are cleared to create more grazing land. This has been especially true in Latin America where 70 percent of Amazon rainforest has been destroyed for cattle grazing. These same grazing cattle are responsible for major land degradation due to erosion and overgrazing. Much of the environmental damage caused by livestock is due to the mass quantities of waste produced when housing large concentrations of animals. With the global shift away from small farms towards larger corporate farms, the waste problem has intensified so drastically that some operations produce as much waste as an entire city. Traditionally, waste produced by livestock would naturally return to the land and become fertilizer, but by concentrating thousands of animals into one indoor building, the modern factory farm has become almost entirely disconnected from the land and has nowhere to return such mass quantities of waste. The result is what the industry likes to call “lagoons,” which is an apt term for an industry shrouded in euphemism and Orwellian doublespeak. Lagoons are massive cesspools of waste often the size of several football fields that are found near every major factory farm in America. Lagoons often burst, contaminating local waterways, or are intentionally spread into nearby cropland without any sort of waste treatment. Runoff after rains contaminates local waterways, causing serious damage to the environment, local wildlife, and local human populations as well. Runoff of chicken and hog waste from factory farms in Maryland and North Carolina is believed to have contributed to outbreaks of Pfiesteria piscicida, a complex flagellate organism that killed millions of fish and caused skin irritation, short-term memory loss, and other cognitive problems throughout the Chesapeake Bay region. Nutrients in animal waste also cause algal blooms, which consume oxygen in water, leading to “dead zones.” Dead zones are areas where there is not enough oxygen to support aquatic life. A dead zone in the Gulf of Mexico fluctuates in size each year, extending to 8,500 square miles during the summer of 2002 and stretching over 7,700 square miles during the summer of 2010. Lagoons also release ammonia, a toxic form of nitrogen which also causes algal blooms that kill fish. And ammonia can travel more than 300 miles through the air before being dumped back onto the ground or into the water. Our insatiable appetite for animal flesh and animal by-products is also one of the leading causes of loss of biodiversity globally. Over-consumption of fish has depleted all 17 of the world’s major fishing areas, which have reached or exceeded their natural limits. While one-third of all global fish-catch is fed to livestock, many scientists predict the total collapse of all fished species within 50 years. The ocean will basically be void of fish if we don’t change our eating habits. Roughly 20% of all currently threatened and endangered species in the US are harmed by livestock grazing. And pesticide use both for crops designed for livestock and for human consumption has a devastating effect on wildlife. Scientists at Cornell University estimate that pesticide use is responsible for killing approximately 67 million birds annually. Pesticide runoff into waterways kills fish and other aquatic life. And scientists are now confirming that the disappearance of the honeybee, which could have truly disastrous effects for our entire crop system, is the result of pesticide and fungicide use. The environmental problems associated with animal agriculture are intricately connected with the issue of world hunger. Increased consumption of animal products means increased use of limited resources such as water and land, as well as increased use of fertilizer, pesticide, fuel, and polluting waste. A study done by researchers at Loma Linda University found that animal-based diets use almost three times more water, two-and-a-half times more raw energy, and thirteen times more fertilizer than do plant-based diets. 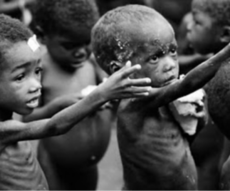 Twenty million people worldwide will die as a result of malnutrition this year. The World Health Organizations says that malnutrition is a factor in at least half of the 12 million annual childhood deaths that occur each year. And yet, 100 million people could be adequately fed using the land freed if Americans reduced their intake of meat by just 10%. In theory, we can feed about 9 billion people. But not when half the world’s crops are used to feed livestock, and over 30% of the planet is used to raise livestock. One third of the world’s fish catch goes to livestock. And in the U.S., for example, 5% of the oats grown are grown for human consumption, while the other 95% go to feed livestock. This represents tremendous inefficiency when humans could eat those crops directly. Forty thousand pounds of potatoes can be grown on one acre of land. Whereas, only 250 pounds of beef can be produced on that same acre. An acre of cereal can provide five times more protein than an acre of beef, and an acre of legumes such as lentils, beans, and peas can produce 10 times as much protein. The estimated percentage of protein that is wasted by cycling grain through livestock is a pretty shocking 90%. Animal-based foods (such as meat, dairy, and eggs) are highly resource-intensive. It takes much more food, land, water, and energy to produce animal-based products than it does to produce plant-based foods. And per-capita meat consumption has more than doubled in the past fifty years, while the global population has increased, meaning that overall meat consumption has increased five-fold and is expected to double by 2050. Adopting a plant-based diet is the single most powerful individual action we can take to help reverse climate change, water and air pollution, deforestation, and loss of biodiversity. Livestock's Long Shadow. UN Report.